Josh Zakim, who is challenging fellow Democrat William Galvin for secretary of state, addresses the Great Barrington Democratic Town Committee Saturday morning at the Claire Teague Senior Center. Great Barrington — Not once did Josh Zakim use the phrase “social justice” to describe his motivation for running for secretary of state, but it clearly is a factor in his thinking. 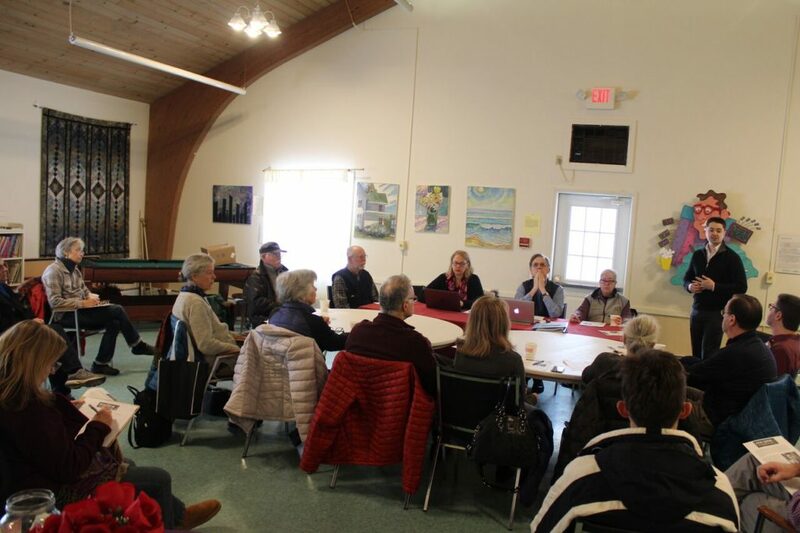 The Boston city councilor, a 33-year-old who is running to unseat fellow Democrat and longtime secretary Bill Galvin, came to a meeting of the Great Barrington Democratic Town Committee Saturday morning at the Claire Teague Senior Center and told the couple of dozen committee members and onlookers that his inspiration to run came from the time he spent chairing the city council’s Civil Rights Committee. As Zakim surely knew, the topic resonates in Great Barrington, which joined Pittsfield and North Adams in Berkshire County in passing its own version of the trust act last year. But as much as Zakim cares about the immigrant community, his focus in running seems to be on voter rights, which makes sense because the secretary of state is also the chief elections officer in Massachusetts. Zakim listed what he called “unreasonable barriers” to voting. It is not easy to register and not easy to get to the polls on election day. So the Civil Rights Committee held hearings and decided to work to make registration and voting easier in Boston. After that hearing, Zakim introduced a bill that would create what he called “almost an automatic voter registration in Boston,” so that when, for example, a resident applies for a residential parking permit, gets a library card, registers for school or otherwise sign up for city services, “you are registered for the opportunity to vote.” Zakim also favors same-day registration. Zakim has also blasted Galvin’s office for appealing a Superior Court ruling last summer that struck down a state law requiring voters to be registered at least 20 days prior to an election in order to participate in it. “That’s the sort of behavior I would expect from elected officials in Alabama or someplace like that, not here in Massachusetts,” Zakim told WBUR last year. He also faulted Galvin for scheduling party primaries this year on Tuesday, Sept. 4, the day after Labor Day, which Zakim has said is a very busy day that clearly discourages voter participation. Zakim also pointed out that the secretary of state is the chief securities regulator for Massachusetts. That portion of the secretary’s job is roughly the state equivalent of the federal Securities and Exchange Commission. “I don’t know about all of you, but I do not expect Donald Trump’s SEC or FBI to be helping small investors or consumers if they’re taken in a stock scam,” Zakim said with more than a hint of sarcasm. “We don’t need someone who is continually going to court to prevent the release of public records and that’s what has been happening far too often,” Zakim said of Galvin. Indeed, Galvin’s reluctance to release information concerning public officials led to a scathing editorial two years ago in the Patriot Ledger of Quincy calling for the state to put the attorney general’s office in charge of public records. The paper called one of his information refusals a “galling act of obstructionism” and recommended voters “terminate Galvin’s employment” in the next election. Lastly, Zakim talked about accessibility, an issue he obviously thinks Galvin, who was first elected secretary in 1994, is vulnerable on. “I talk about literally and figuratively opening up the office, being out across the commonwealth–not just on Beacon Hill–answering phone calls and emails,” Zakim said. But Zakim kept returning to the issue of voting, which he characterized as “our most fundamental right.” He acknowledged that some of his ideas will require legislation and that the path will not always be easy but it does require leadership, something he clearly thinks has been lacking from Galvin’s office. Committee member Fred Clark noted that, “First of all, you get a lot of points for just showing up.” Clark noted that the Boston area, inside the I-495 beltway, comprises some 70 percent of the state’s lawmakers and population, so Zakim’s trip to the Berkshires is commendable. Clark asked what could be done to help town clerks provide the necessary services for elections. Zakim said it’s not only a matter of budgetary support from the secretary’s office but also in advocating for change with lawmakers on Beacon Hill. Galvin’s office is not used to a vigorous challenge from another Democrat–or even from a Republican, for that matter. Since his election in 1994, Galvin, 67, has been primaried only once–in 2006 by attorney John Bonifaz, whom Galvin trounced 87 percent to 17 percent. In December, Galvin branded Zakim “sneaky” in the way he went about organizing his candidacy and suggested Zakim was trying to increase his name recognition for a future race. Notwithstanding his sarcasm, Galvin is clearly concerned, so the race bears watching. And the fact that Zakim was willing to get up at 6 a.m. on a Saturday and drive out to the hinterlands from the Back Bay suggests he knows it’s best not to ignore the Berkshires. Will Mr. Zakin’s challenge to Sec. Galvin require every Democrat to remember to vote in their primaries? It is vital that we support those candidates who are willing to come calling. I would like to think that Sen. Hinds’ vibrant presence in Boston is causing a second look at who we are and what we are about out here, so let’s stay focused in bringing young people into the political arena and not only register to vote, but make sure you vote in your primaries as well.